Nicely put together British wartime melodrama powered by an ace ensemble. Please give Katherine Parkinson's Isola her own spin-off movie where she visits Juliet in London. You imagine that the makers of The Guernsey Literary and Potato Peel Pie Society probably had a few meetings about whether there might be a more streamlined and sleek title for this film about the Guernsey Literary and Potato Peel Pie Society. Something hashtaggable, something you can fit into a tweet without using up all your characters. Upon watching the film it becomes quickly evident that this title is unavoidable and inevitable, so integral is the Guernsey Literary and Potato Peel Pie Society to its dramatic machinations. The Guernsey Literary and Potato Peel Pie Society came into being during World War Two when Guernsey was suffering the indignity of German occupation. Yet it wasn’t as cover for any local resistance, more as a way to keep spirits up during trying times. Among the select crew is Penelope Wilton’s melancholy Ameila, Tom Courtenay’s ageing postmaster Eban, Katherine Parkinson dotty gin queen Isola and Jessica Brown Findlay’s Elizabeth, who is no longer on the scene when Juliet finally pitches up. The plan is to turn a quick jaunt to the channel islands into a nice broadsheet essay on the story behind this strange little book group, yet the more Juliet digs for information, the more it seems that her host would rather she didn’t. 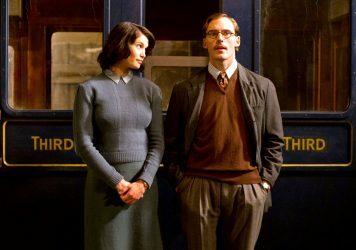 Directed with admirable robustness by veteran British director Mike Newell, the film sets out its stall as a comedy of clashing cultures and quaint parochial life, before fanning out into a tale of wartime intrigue and familial sacrifice. The film doesn’t do anything out of the ordinary, instead pressing down on the same old notes with confidence and poise. The story is a bit of a runabout, too, as it’s a case of watching Juliet connect pieces of the puzzle by essentially begging different characters to reveal the next salient plot point. On the plus side, it boasts a clutch of well-oiled character turns, with Courtenay bringing a measure of stolid empathy to what initially appears as an accident-prone old geezer, and James keeping things interesting in the lead. Top trump, however is Parkinson who brings genuine weight to a comic relief role. A beautiful sequence where she and Juliet discuss romance and escape while bunking together is the film’s lowkey highlight. 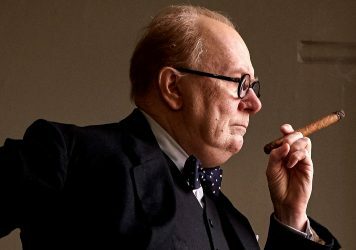 Gary Oldman is on career-best form in this standard issue Winston Churchill biopic from director Joe Wright. 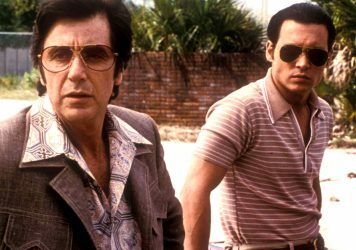 Is Donnie Brasco the last truly great American gangster movie? Johnny Depp is on career-best form in Mike Newell’s classic crime-thriller from 1997.